Wales will play two of their weaker 2010 World Cup qualifying group rivals at home in their first three matches. The fixtures meeting was held on Thursday in Frankfurt and Wales begin against Azerbaijan on 6 September. 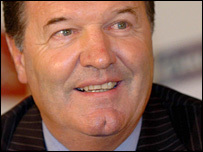 Four days later John Toshack's men travel to face Russia, one of the more powerful teams in Group Four. Wales' next two games in October see them at home to Liechtenstein, followed by a tough trip away to face group favourites Germany. Finland come to Wales on 28 March 2009, followed by Germany on 1 April before Wales go to Azerbaijan on 6 June. Russia are the visitors on 9 September and Wales finish their campaign next October in Finland and Liechtenstein. FAW secretary David Collins said he was happy with the fixtures, which do not take up friendly dates. "The major points we wanted, we were able to get," he said. "We have the two top seeds and the two bottom seeds in the first two months of the championship. "All of our dates are on competitive dates. "And by agreeing to play in Azerbaijan on Saturday, 6 June, the match itself will not kick-off before 2000 local time, so we've been able to ensure playing in the relatively cooler part of the day."